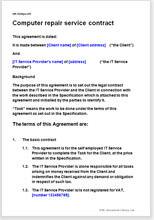 Simple contract for self employed IT and computer repair service engineer working in home of client. You may work in your own name or through your company. It is assumed that the work will be unsophisticated; examples: fix bugs, supply and set up hard disk, change software settings, installations and 1001 small tasks. Main purpose of contract is disclaimer of liability for your professional work. Also sets out your requirements for work specification, access, and so on. Just add specification for actual computer repair work and you have contract form suitable for private client. As an IT contractor / computer repairer, you need protection. If you have not arranged for up front payment you are always at risk that your client will not pay. We give you the option of several alternative payment procedures from all up front to all on credit. Limitation of liability also features large in this contract.